The Airpura F600 standard model features 18 pounds of highly absorbent, premium-quality activated carbon. This filter collects moderate to heavy chemical pollution stemming from formaldehyde, ammonia, smoke, pesticides, glues, adhesives, and other building and construction materials. 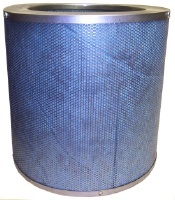 The carbon filter typically lasts up to 2 years, depending on usage.